The 2017 Holiday Release Round Up! The holiday season is upon us once again! As always, this means the usual lot of seasonal releases — some sentimental, others jolly, and even a few wacky contributions. Here at Seoulbeats, it’s one of my favorite times of the year, because special releases often mean less pretenses, and they’re an opportunity for artists to indulge fans with the gift of music. Really, K-pop Christmas is a gift that keeps on giving. However, with the news of the past week, it’s been hard to get into the holiday spirit. As such, my favorite seasonal releases this year have been more sombre in nature. 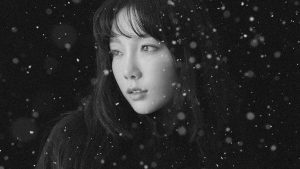 Taeyeon‘s “This Christmas” has taken on new meaning for me since my review, the idea of missing someone feels so much stronger in the wake of recent news. Listening to it now, I find myself thinking back to one of my all time favorite K-pop Christmas tracks: Shinee‘s “Santa Claus is Coming to Town,” and reminiscing on happier memories. Similarly, label-mate Lay‘s “Goodbye Christmas” has struck a chord. My top three is rounded out by Zion.T‘s “Snow,” which also looks back on the joy of the past. On the more festive end of the spectrum, Twice‘s “Merry & Happy” succeeded in adding some holiday cheer to the week before Christmas. And, while I’m rarely one for rap remixes of holiday tunes, NCT Dream‘s “Joy” was a surprising mash up of Christmas classics. In terms of the completely silly, JeA and Kim Young-chul‘s “An Ordinary Christmas” was just the right balance of kitschy and snarky for the season. In South Korea — where Christmas is a couple holiday, and social media is everything — the track is especially biting with it’s candid satire. So, without further ado, here is the SB playlist of Holiday 2017 releases. Be sure to share your favorites in the comments section!